Visualizing a completed print design project is important during the design stage, but it is essential before going to press. Proofs can provide the information a designer or client needs to be confident the completed print job will look as planned. A proof is a representation of how a digital file will look on the printed page. You can use it to confirm that the correct fonts, graphics, colors, margins, and overall positioning are all in place before you give the go-ahead to your commercial printer. There are different types of printing proofs, and they serve different purposes. Desktop proofs are useful and inexpensive for designers to run as they work on a job to confirm text accuracy and graphics placement. It is a good practice to print a proof from your desktop printer and send it along with the digital files to your commercial printer. Even a black and white proof can be helpful, but a good color proof is ideal. If the file won't print properly to a desktop printer, chances are it won't come out on the printing press correctly either. Proof your files carefully at this stage. After you hand over the project to your commercial printer, changes or corrections may incur an additional charge and can cause delays. Your printer may send you a PDF proof electronically. This type of proof is useful for proofing type and seeing that all the elements appear as anticipated, but it is not useful for judging color accuracy, as each monitor it is viewed on may be calibrated differently or not at all. All designers should request at least a PDF proof of their print jobs from the printer. A digital prepress proof is made from the files that are about to be imaged to the printing plates or transferred to a digital press. A high-quality color digital proof is color accurate. After your approval, that proof is given to the press operator who is instructed to use it for reliable color matching. If your concerns are about color, this is the proof that you need to request to feel comfortable that the colors you imagined will appear on the finished product. Bluelines are specialty proofs used to check book pagination. They aren't useful for color information because they are blue — all blue. However, they are made from the files that will be plated and printed, so everything else can be checked at this point. Often, bluelines are folded, collated and trimmed to represent the final book. Bookbinding doesn't occur until after the job is printed, but if the pagination is incorrect at the press, pages end up in the wrong place at the bindery, ruining the job. For a press proof, the imaged plates are loaded onto the press and a sample is printed out on the actual paper stock that the job will print on. The press operator waits for approval while the designer or client views the proof. Press proofs are the most expensive of all the types of printing proofs. 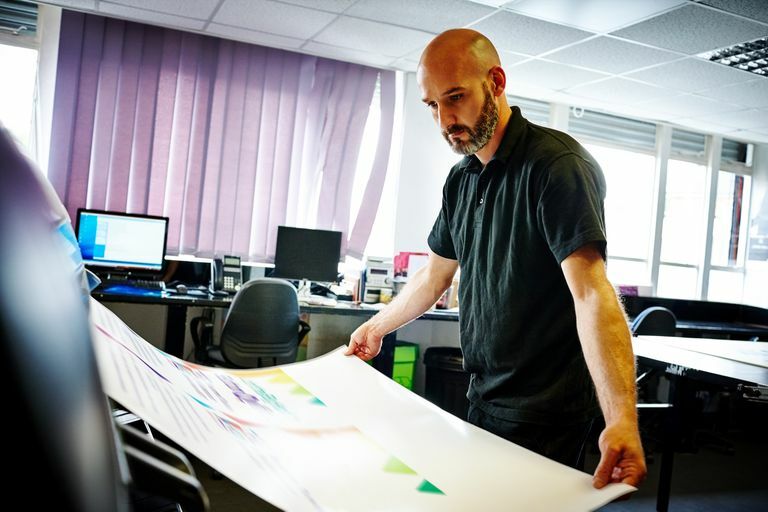 Any changes made at this stage send the job back to prepress, incur unused press time charges, require new plates, and possibly delay the anticipated due date. Changes at the press proof stage increase the cost of the print job. Because of the expense of a press proof, and the advancement in digital proofing, press proofs are not as popular as they once were. Beware. Don't rush the approval of a proof. Take all the time you need to look not just for what is right but also for what is wrong. Proofread it several times. After you approve a proof, as long as the printed product matches it, you are responsible for any errors in the print job.